The LHA undertook a study this past summer to document the situation with our invasive weeds in preparation for becoming more aggressive about their control. We now have the final report from the Connecticut Agricultural Experiment Station and have received a mitigation proposal from one of the control contractors suggested by the state, Solitude Lake management, to undertake a herbicide treatment this coming summer. Not surprisingly, the study documents the dramatic increase in invasive weed population since the original study, conducted in 2005. 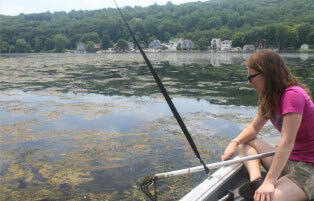 For example, the Eurasian milfoil covered 5 acres in 2005, but now covers 139 acres! And we wonder why we can't get anywhere on the river! Our budget requests to the towns includes the proposed herbicide treatment program.Our initial feedback is that we have the support of all the member towns and cities. The weed treatment will be approximately $35,000 to 40,000. The LHA has also approached Yale and The New Haven Rowing Club for their support as well. Update as of 5/30/18. The LHA has applied for a permit to treat 150 acres. The permit has been approved by the individual towns and agencies and now is waiting on DEEP for final approval. DEEP has approved 80 acres but to get the full 150 acres requires a higher level signature. As a result the permit is delayed. Initially we were targeting the first week of June. We hope to have the full 150 acres approved for treatment by the end of June. We have a tentative target date of treatment of 6/21/18. Latest Update as of 7/15/18. The treatment was sucessfully applied on 7/11. The LHA received full cooperation from the community with full compliance to the treatmnent notice instructions. Thank you to all for your cooperation and doing your part to make this sucessful.